What is it about pearls that appeals to us so? Maybe it’s because fine natural pearls are so rare? Or that we associate them with class, royalty and femininity? George Kunz says, “The pearl, like a lady of old, pure and fair to look upon, is the emblem of modesty and purity.” Whatever your reasons, here are some interesting facts about this mysterious and beloved orb. The pearl was adopted by the American National Association of Jewelers in 1912 as the official birthstone of June, along with alexandrite and moonstone. Pearls are also the birthstone for the sun signs of Gemini and Cancer, and are traditionally given as a 30th wedding anniversary gift. Pearls are organic gems created when a tiny irritant, usually a parasite, enters a mollusk, such as an oyster, mussel, or clam. Annoyed by this foreign invader, the mollusk begins coating it in a natural substance it produces called nacre (pronounced NAY-ker). Nacre is made up primarily of aragonite (a carbonate crystal) bonded with weaker materials, such as proteins and chitin. The oyster slowly coats the irritant in layers of nacre, over time forming a pearl. Not all pearls are round, but perfectly symmetrical pearls are generally the most desired and expensive. Pearls are primarily found in oyster beds in the Persian Gulf, along the coasts of India and Sri Lanka, and in the Red Sea. Chinese pearls come mainly from freshwater rivers and ponds, whereas Japanese pearls are found near the coast in salt water. It’s an interesting mechanical phenomenon how round pearls are created. When you look at a pearl up close under a microscope, it’s actually not smooth, but covered in tiny sawtooth-like steps or terraces. When a mollusk is forming a pearl, water molecules around the pearl warm up, pushing off the small terraces, causing a tiny amount of rotation in one direction. The oyster very slowly and naturally turns, like a ratchet, thus creating a round-shaped pearl. There are essentially three types of pearls: natural, cultured and imitation. Because of today’s technology, there are many cultured pearls that are not only stunning to behold, they are affordable to the average jewelry fan. Natural pearls, on the other hand, have always been a rarity, and are an expensive indulgence usually reserved for the rich and famous. You can tell if a pearl is real by sliding it across your teeth. If it’s gritty, it’s probably real. For some pearl perspective, in 1913, Pierre Cartier traded a single strand of 55 natural pearls valued at $1.2 million to banker Morton Plant in exchange for his mansion on Fifth Avenue in New York City! That same property is now Cartier’s U.S. flagship store at Fifth Avenue and 52nd Street. While on their honeymoon in Japan in 1954, Joe DiMaggio presented Marilyn Monroe with a 16-inch, single-strand Akoya pearl necklace consisting of 44 Mikimoto pearls. The necklace has been shown around the world as part of a traveling exhibition sponsored by the American Museum of Natural History in New York, and the Field Museumin Chicago. It is currently owned by Mikimoto (America) Co., Ltd. as part of a valuable collection of pearls and pearl jewelry. Jacqueline Kennedy Onassis loved her pearl necklaces and made them wildly popular while she was in the White House. Her signature piece as First Lady was a triple-strand faux pearl necklace designed by jeweler Kenneth Jay Lane. The necklace went on to sell for $211,500 at a Sotheby’s auction. Shortly after her death in 2011, Elizabeth Taylor’s La Peregrina pearl necklace was sold at Christie’s “The Collection of Elizabeth Taylor” auction for $11.8 million — the highest amount any pearl has ever sold for at auction. Pearls also have a rich history of mythology and lore attached to them. Cultured and freshwater pearls are considered to offer the power of love, money, protection, and luck. Pearls are also thought to give wisdom and keep children safe. Ancient legend also associates pearls with fertility, and pearls still have a strong feminine energy today. Pearls were thought to be the tears of the gods, and the Greeks believed that wearing pearls would promote marital bliss and prevent newlywed women from crying. Are you in the market for pearls? 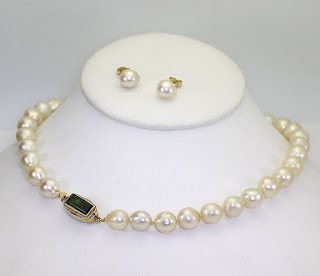 If you’re looking for a unique gift for a June birthday girl, or you’re looking for a strand of pearls for yourself, shop Adina’s Ebay store for stunning estate, vintage and antique fine jewelry, available at true wholesale prices. We have vast selection of pearl jewelry and we will deliver a buying experience that’s above your expectations.